Starches and dietary fiber are complex carbohydrates because of their chemical structure, according to Iowa State University. Sources of complex carbohydrates include include beans, lentils, starchy vegetables and whole grains, such as cereal or whole-wheat or multi-grain bread. Eat whole grains as part of a balanced diet along with other carbohydrates, healthy fats and lean proteins. All grains are sources of complex carbohydrates, but whole grains are especially healthy sources because they include heart-healthy nutrients such as selenium, potassium and magnesium. At least half of your grains should come from whole grain sources. A slice of whole-wheat bread has about 69 calories and provides 3.6 g of protein and 1.9 g of fiber while a slice of refined white bread contains 0.6 g of fiber, 66 calories and 1.9 g of protein. Whole wheat bread comes out on top. Whole grain bread is better for you if you choose a fortified brand. Fortified whole grains have niacin, riboflavin, thiamin, folic acid and iron added to them, according to the 2010 Dietary Guidelines from the U.S. Department of Health and Human Services. The healthiest approach is to vary your sources of complex carbohydrates. Beans and lentils are high in protein and dietary fiber, and starchy vegetables, such as carrots and winter squash, are high in vitamins. Your body gets energy from calories in food, and each 1-oz. slice of whole-wheat bread provides 70 calories, with most of that from carbohydrates. Carbohydrates provide the majority of energy for daily living and physical activity, according to Iowa State University. Sugars are fast to digest, and the energy does not last long. 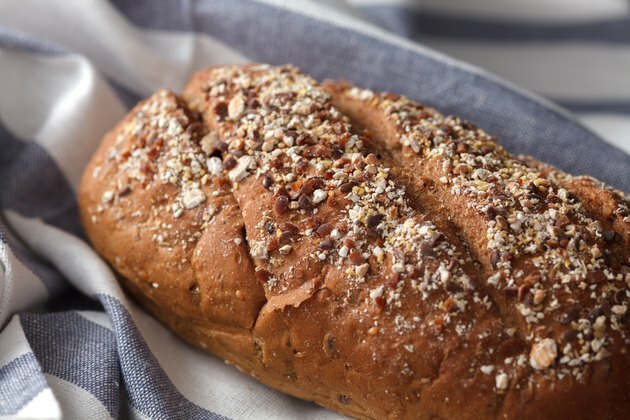 Your body is slower to digest and absorb complex carbohydrates, and whole-grain bread provides longer-lasting energy to get you through your workout or day than refined simple carbohydrates such as white bread. Eat whole-grain bread only in moderation because too much of any food, even healthy foods, leads to weight gain. Almost all kinds of bread are high in sodium from added salt, and a high-sodium diet may cause high blood pressure, which increases your risk for stroke and kidney disease. Each 1-oz. serving of whole-wheat bread has 134 mg sodium, and lower-sodium whole grains include oatmeal, bulgur, barley and low-sodium bread. Starchy vegetables, such as sweet potatoes and corn, are also low-sodium complex carbohydrates.